Are you looking for an application that allows you to listen to free mixtapes, hip hop music, videos and underground hits? Well, if you are, you will be glad to know that with the DatPiff Mobile Cydia app you will be able to do just this! Simply download the DatPiff Mobile app from Cydia and you are good to go. If you are interested in Datpiff Mobile you can find it through the ModMyi repo for free. If you are a Facebook fanatic and would like a way to access Facebook from the iOS Spotlight then the Spotfb Cydia tweak is for you! Simply download and install that weak and you can find the full list of commands by typing in Spotfb help into the iOS Spotlight. Personally, I have found just launching the actual Facebook app to be quicker then Spotfb, but I am sure others will find this a faster way to update your status for example. Note: You must have the official Facebook app installed and be logged into your account. Another thing to keep in mind is that the tweak does not add any icons to your SpringBoard and furthermore does not have any configurable options. You can find Spotfb through the ModMyi repo for free. The Checkpwn Cydia application was released for developers only and is of no use to everyday users. If you are a developer, however, Checkpwn allows for easy patching and backing up of the Checkpoint.xml file, in order for libgpod to be able to work. The developer notes that when iTunes won’t sync after the patch is applied the file can be restored to the original state and iTunes will sync again. If you are interested in the app you can find it through the BigBoss repo for free. Most of the time, when you launch Cydia, you’ll find some upgrades waiting for you to install. Most of them are essential upgrades that need to be done so your jailbroken iOS device functions properly. Unfortunately, there is no automatic notification system for Cydia, that could tell you to upgrade a certain jailbreak tweak. Wouldn’t it be lovely, if Cydia itself gave you notifications on apps/tweaks that need to be updated? With the CydiaBulletin jailbreak tweak, it certainly looks possible. As you can see in the screenshot, a notification for the tweak ‘Activator’ is patiently waiting to be swiped or tapped on. This is useful and a much awaited tweak. There would be no need to launch Cydia and look for apps or tweaks that need to be updated. CydiaBulletin still isn’t available in Cydia, and we have no idea when it will be, but we’ll make sure that you know of it as soon as it’s released. What do you think of this tweak? 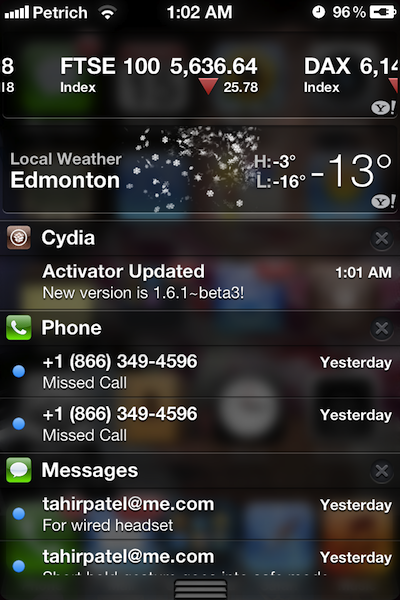 Developer Ryan Petrich tweeted yesterday a new screenshot for his upcoming CydiaBulletin Notification Center Widget. What the widget will do is alert you of updates to installed Cydia tweaks on your iPhone, iPod Touch or iPad right from the Notification Center. This is useful because you will no longer have to periodically launch Cydia to check for updates. Instead you will always know when new Cydia tweak updates are available right from the Notification Center. It was in the app store. They took it out for some reason.